1. B 14.0 g of Si is 0.50 mol, and 32.0 g of oxygen is 2.0 mol. Converting that to a whole number ratio gives us 1 mol of Si for every 4 moles of O. 2. B In phase I, an increased temperature means the molecules are moving faster and will spread out more, leading to an increased volume. For the volume to remain constant in phase II, either both pressure and volume have to remain constant, or they both have to increase or decrease together, as they are inversely proportional. 3. B Weak acids have a very low dissociation value, and for polyprotic weak acids the second dissociation is always weaker than the first. 4. D Between trial 1 and 3, the concentration of NO doubled while the concentration of Br2 held constant, and the rate went up by a factor of four. So, the reaction is second order with respect to NO. Between trial 1 and 2, the concentration of NO was held constant while the concentration of Br2 doubled, and the rate went up by a factor of two. Thus, the reaction is first order with respect to Br2. 5. D One way to calculate enthalpy is by subtracting the strength of the bonds broken in the reactants from the strength of the bonds formed in the products. If the first value is greater than the second value, the overall enthalpy change will be negative. 6. B Equivalence is reached when the conductivity of the solution reaches it’s minimum value, meaning as many of the precipitate ions are out of solution as possible. As the formula of the precipitate is CaCO3, for every mole of sodium carbonate in the beaker, one mole of calcium nitrate will be needed. As both solutions have equal molarity, equal volumes of each would be necessary to ensure the moles are equal. 7. A At the equivalence point, the moles of Ca2+ and CO32- in solution will be negligible. 8. 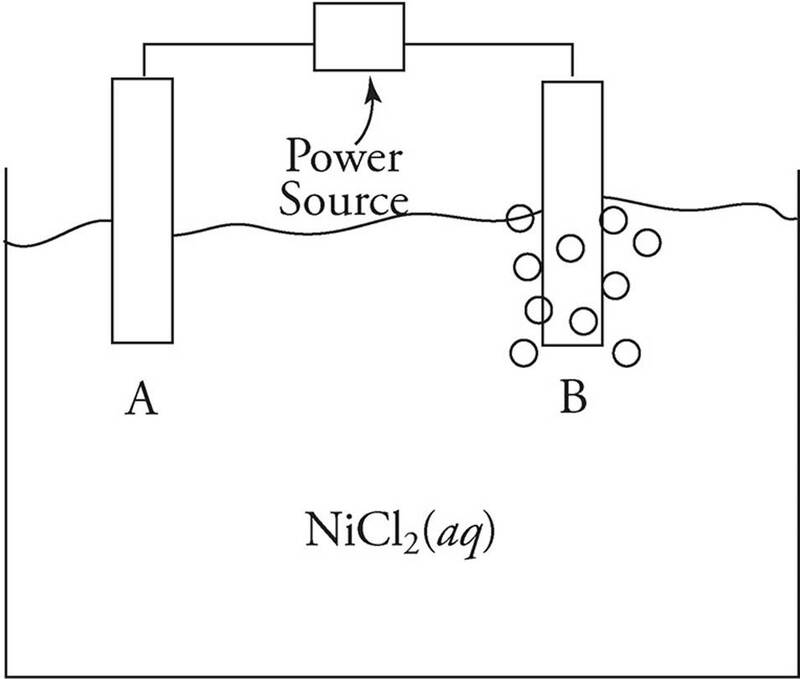 A The Ca2+ ions will have nothing to react with, so they will just remain in solution (as will the extra NO3− ions being added), increasing the conductivity. 9. D The equivalence point is reached when there are equal moles of each reactant present. Diluting the sodium carbonate solution will not change the number of moles of Na2CO3 present in solution. 10. C For every two moles of CO that react, one mole of O2 will also react. If one mole of CO reacts, half a mole of O2 will react. At that point, the concentration of CO will be (1.0 mol/4.0 L = 0.25 M) and the concentration of the O2 will be (1.5 mol/4.0 L = 0.38 M), rendering choice (C) impossible. 11. C The farther away an electron is from the nucleus, the less ionization energy that is required to eject it, and as a result, the electron will have more kinetic energy after it is ejected. The 3p subshell is the farthest one that a neutral chlorine atom would have electrons in. Beware of choice (D); chlorine does not have a 3d subshell. 12. D Temperature in Kelvins is a measure of kinetic energy. When that temperature doubles, so does the kinetic energy. However, a doubling of the temperature in Celsius, while increasing the amount of kinetic energy, would not double it. 13. A This is a straightforward concept to understand. The average atomic mass of an element on the periodic table measures both the average mass of a mole of atoms of that element in grams, as well as being the average mass of a single atom of that element in amus. 14. A A proton is transferred from the water to the HS− ion, making the reaction an acid/base reaction. 15. 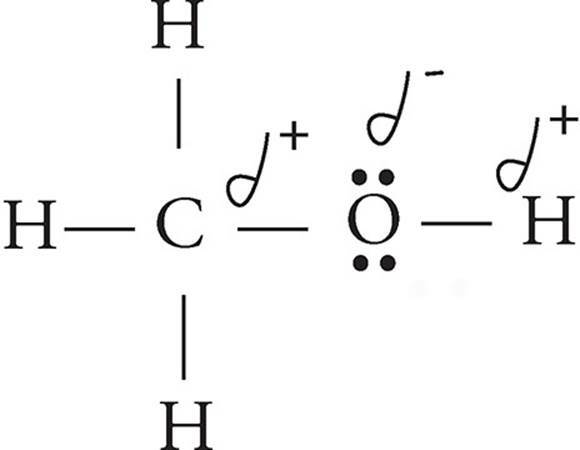 C Strong bases dissociate to donate hydroxide ions into a solution and weak bases cause the creation of hydroxide ions by taking protons from water. However, weak bases do not protonate strongly, meaning there will not be nearly as many ions in solution for a weak base as there are for a strong base. Thus, weak bases are not good conductors. 16. C The Cr2O72-(aq) gains electrons to change the oxidation state on Cr from +6 to +3. 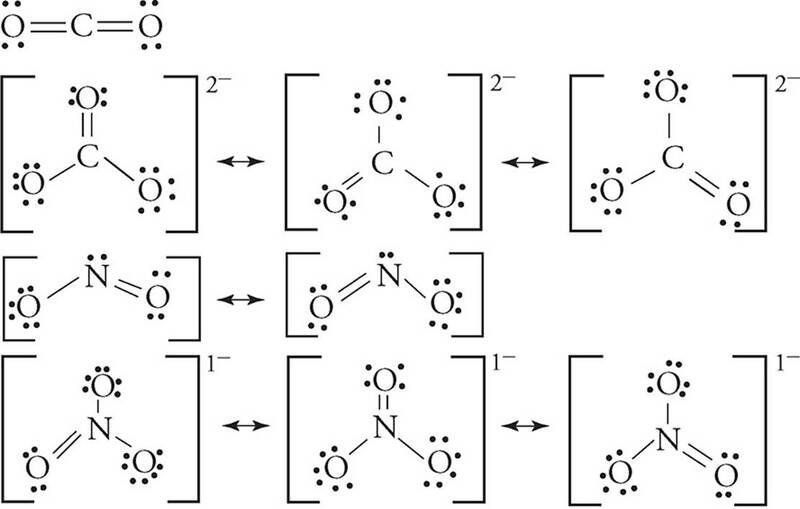 The Ni(s) loses electrons to change the oxidation state on Ni from 0 to +2. 17. D In one mole of dichromate, two moles of chromium are reduced, each requiring three moles of electrons. Three moles of nickel are being oxidized, each requiring two moles of electrons. Thus, six moles of electrons are being transferred. 18. B As the reaction progresses, the H+ ions are converting to H2O molecules. This would raise the pH of the solution. As the reaction progresses, the solution will become less acidic, but there is no mechanism for it to become basic. 20. B Diagram B represents an atom of neon, which has three subshells: 1s, 2s, and 2p. Electrons from each subshell would have a different binding energy, yielding three peaks on a PES. 21. A The bond length always corresponds to the point where the potential bond energy (a balance of the attraction and repulsion forces between the two atoms) is at its minimum value. 22. C The bonds between HF molecules are hydrogen bonds, which are very strong dipoles created due to the high electronegativity value of fluorine. No other hydrogen halide exhibits hydrogen bonding, and thus they would have weaker intermolecular forces (and lower boiling points) than HF. 23. C Weak acids resist changes in pH more effectively than strong acids because so many molecules of weak acid are undissociated in solution. The base must cause those molecules to dissociate before affecting the pH significantly. 24. D Using M1V1 = M2V2, we can calculate the amount of stock solution needed. (12.0)V1 = (4.0)(100.0), so V1 = 33.3 mL. When making solutions, always add acid to water (in order to more effectively absorb the heat of the exothermic reaction). The more negative this value is, the more energy that was released in the bond formation of the products compared to the amount of energy necessary to break the bonds in the reactants. 26. A The largest entropy changes arise from phase changes. Converting a solid into a gas greatly increases the disorder in the system, and thus the entropy. 27. D The addition of a catalyst speeds up the reaction but will not affect the enthalpy or the entropy values. 28. C 2.0 moles of CH4 would react with 2.0 moles of H2O, leaving 1.0 mole left. It would also create 6.0 moles of H2 and 2.0 moles of CO.
29. B Going from fewer gas molecules to more over the course of the reaction increases the overall disorder in the system, and thus the entropy of the reaction. 30. A London dispersion forces are created by temporary dipoles due to the constant motion of electrons in an atom or molecule. 31. B The higher the temperature of any substance, the larger the range of velocities the molecules of that substance can have, and thus the more disorder the substance can have. A Maxwell-Boltzmann diagram represents this in a graphical form. 32. B Strong acids and bases do not make good buffers, so that eliminates (A) and (D). Of the remaining choices, a solution of H2PO4− would with a Ka in the 10−13 range would have a [H+] of . That would put [H+] between 10−6 and 10−7, yielding a pH in the required range. 33. D Distillation involves the boiling off of substances with different boiling points. The other three compounds are all ionic, meaning that in solution they are free ions. If we were to boil off all of the N2H4 and the water, the remaining ions would all mix together to form multiple precipitates. However, by heating the solution to a boiling point greater than that of N2H4 and lower than that of water, the N2H4 can be collected in a separate flask. 34. C At identical temperatures, the gases would all have identical amounts of kinetic energy. In order for that to happen, the gas with the lowest mass (H2) would have to have the highest average velocity, and the gas with the highest mass (F2) would have to have the lowest average velocity. 35. A Like dissolves like, so ionic substances dissolve best in ionic compounds, eliminating (B). Both (C) and (D) share an ion with MgCl2. Via the common ion effect and Le Châtelier’s principle that would reduce the solubility of the MgCl2 in those solutions. The best choice is (A). 36. D The outermost s-block electrons in a transition metal tend to be lost before the d-block electrons do. Additionally, the other options do not accurately describe the properties of transition metals. 37. C Adding or removing a solid would not cause any equilibrium shift. Decreasing the concentration of the Fe2+ causes a shift to the right, which would increase the potential of the cell. CO2 has a bond order of 2, which exceeds the order of the other structures. Remember that a higher bond order corresponds with shorter and stronger bonds. 39. D Except for CO2, the other three molecules all display resonance. 40. D All three of those structures have three electron domains, and thus sp2 hybridization. 41. C The bond angle of NO2− would be less than that of NO3− or CO32− because the unbonded pair of electrons on the nitrogen atom reduces the overall bond angle. 42. D Even if this were true, any pathways that become available at higher temperatures would be less likely to be taken than the original pathway. 43. D The Na+ cations would be attracted to the negative (oxygen) end of the water molecules and the Cl− anions would be attracted to the positive (hydrogen) end. Additionally, Na+ ions are smaller than Cl− ions as they have less filled energy levels. 44. B In this case, the pH is greater than the pKa. This means that there will be more conjugate base present in solution than the original acid. The conjugate base of HNO2 is NO2−. 45. A Combustion reactions are irreversible, while the other reactions are examples of acid-base, dissolution, and oxidation-reduction, all of which are reversible in this case. 46. A Equilibrium is always products over reactants, and coefficients in a balanced equilibrium reaction become exponents in the equilibrium expression. 47. C The concentration of the H2S will decrease exponentially until it reaches a constant value. The concentrations of the two products will increase exponentially (the H2 twice as quickly as the S2) until reaching equilibrium. 48. C Increasing the pressure causes a shift towards the side with fewer gas molecules—in this case, a shift to the left. This means the reverse reaction rate increases while the forward reaction rate decreases. 49. A The reaction will progress until Q = Kc. If Q < Kc, the numerator of the expression (the products) will continue to increase while the denominator (the reactant) increases until equilibrium is established. 50. A If the temperature is constant, then the equilibrium constant K is unchanged. Via DG = −RT ln K, if K and T are both constant then so is the value for ∆G. 51. C An ionic substance would dissolve in water, and a nonpolar covalent substance would have a low melting point. A metallic substance would be a good conductor. The only type of bonding that meets all the criteria is covalent network bonding. 52. C Light contains energy (via E = hv), and that energy can be used to cause a reaction. 53. B In 200 seconds, half of the original sample decayed. In another 200 seconds, half of the remaining sample decayed. This demonstrates a first order reaction. 54. D Ox has 6 valence electrons and 7 assigned electrons: 6 − 7 = −1. Both Oy and the N atoms have the same number of valence and assigned electrons, making their formal charges zero. 55. B The strength of an atom’s magnetic moment increases with an increase in the number of unpaired electrons. Nitrogen has the most unpaired electrons (3), and thus the strongest magnetic moment. 56. D Sulfur is the only element with an empty d-block in its outermost energy level, and is thus the only atom of the four which can form an expanded octet. 57. C Neon has six electrons in its subshell with the lowest ionization energy (2p), and only two electrons in the other two subshells (1s and 2s). This means the 2p peak will be three times higher than the other two peaks. 58. B The amount of matter is equal on both sides of the reaction. None of the other options are supported by the diagram. 59. A The overall rate law is always equal to the rate law of the slowest elementary step. The rate law of any elementary step can be determined using the coefficients of the reactants in that step. 60. A Reactions with high activation energies that do not proceed at a measurable rate are considered to be under kinetic control—that is, their rate of progress is based on kinetics instead of thermodynamics. (a) In order to achieve the degree of accuracy shown in the table above, select which of the following pieces of laboratory equipment could be used when measuring out the CoCl2. The 50-mL buret is what is needed here in order to get measurements that are accurate to the hundredths place. Graduated cylinders are generally accurate to the tenths, and using flasks or beakers to measure out volume is highly inaccurate. For samples 2−4, the first step is to calculate the number of moles of CoCl2, using the Molarity = moles/volume formula. Then, divide the number of moles by the new volume (volume of CoCl2 + volume H2O) to determine the new concentration. If gloves are not worn when handling the cuvettes, fingertip oils may be deposited on the surface of the cuvette. These oils may absorb some light, increasing the overall absorbance values. Values from any sample can be used with identical results. 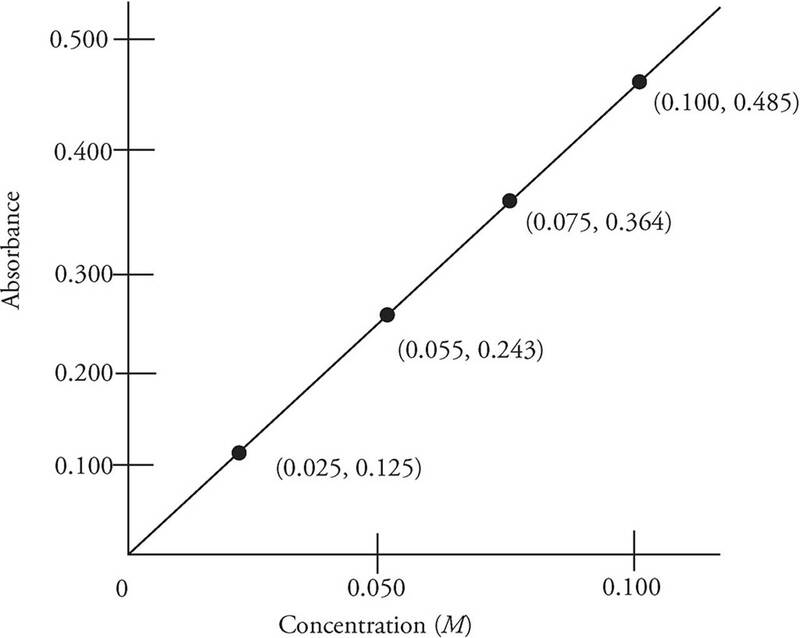 (e) On the axes below, plot a graph of absorbance vs. concentration. The y-axes scale is set, and be sure to scale the x-axes appropriately. 2. A sample of liquid butane (C4H10) in a pressurized lighter is set up directly beneath an aluminum can, as show in the diagram above. The can contains 100.0 mL of water, and when the butane is ignited the temperature of the water inside the can increases from 25.0 °C to 82.3 °C. The total mass of butane ignited is found to be 0.51 g, the specific heat of water is 4.18 J/g·°C, and the density of water is 1.00 g/mL. The formula needed is q = mc∆T. The sign on the heat calculated in (b)(i) needs to be flipped, as the combustion reaction will generate as much heat as the water gained. (c) Given butane’s density of 0.573 g/mL at 25 °C, calculate how much heat would be emitted if 5.00 mL of it were combusted at that temperature. The overall reaction is exothermic because more energy is released when the products are formed than is required to break the bonds in the reactants. (e) One of the major sources of error in this experiment comes from the heat which is absorbed by the air. Why, then, might it not be a good idea to perform this experiment inside a sealed container to prevent the heat from leaving the system? Performing this reaction in a sealed container would limit the amount of oxygen available to react. To get an accurate heat of combustion for butane, it needs to be the limiting reactant, and if the oxygen runs out prior to all the butane combusting, that will not happen. Alternatively, the pressure of the sealed container could exceed the strength of the container and cause an explosion. There are approximately twice as many gas molecules after the reaction as there are prior to the reaction, and that means the pressure would approximately double if the reaction goes to completion. Due to the stoichiometric ratios, 4 moles of NO2 are created for every 2 moles of N2O5 that decompose. Therefore, the rate of appearance of NO2 will be twice the rate of disappearance for N2O5. As that rate is constantly changing over the course of the reaction, it is impossible to get exact values, but the ratio of 2:1 will stay constant. First order decompositions always create a straight line when plotting the natural log of concentration of the reactant vs. time. Any (non-intercept) values on the graph can be plugged in to determine the rate constant. So k = 5.40 × 10−4 s−1. Any point along the line will give the same value (as it is equal to the negative slope of the line). Catalysts speed up the reaction, so adding a cataylst would increase the rate of disappearance of N2O5. 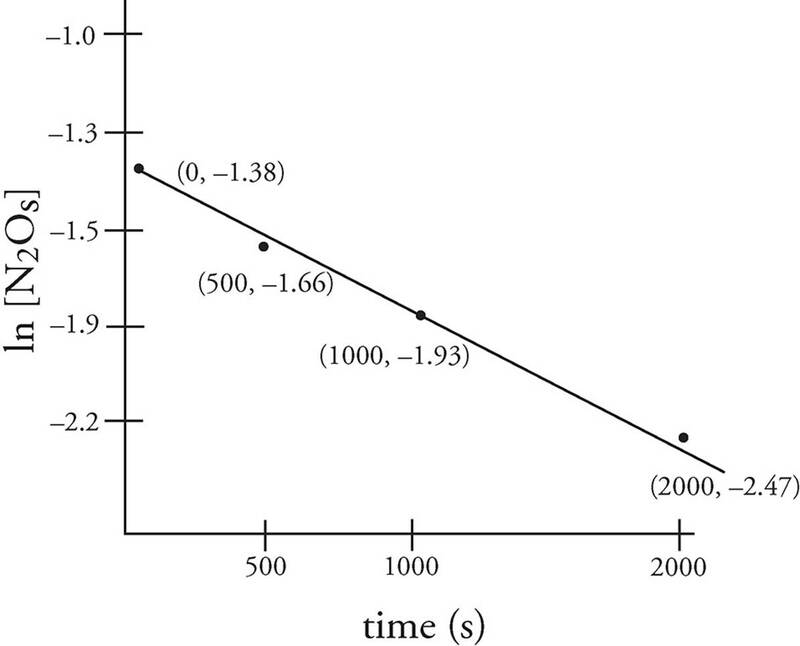 If the reaction is moving faster, the slope of any line graphing concentration vs. time would be steeper. This increases the magnitude of the slope, and thus, increases the magnitude of the rate constant as well. If the reaction is proceeding at a faster rate, it will take less time for the N2O5 to decompose, and thus the half-life of the N2O5 would decrease. The strongest type of intermolecular force present here is hydrogen bonding, which both n-Butylamine and methanol exhibit. Of the two, n-Butylamine would have the stronger London disperion forces as it has more electrons (is more polarizable), and so it has stronger IMFs than methanol. For the remaining two structures, propanal has permanent dipoles while pentane is completely nonpolar. Therefore, propanal would have stronger IMFs than pentane. Vapor pressure arises from molecules overcoming the intermolecular forces to other molecules and escaping the surface of the liquid to become a gas. Due to its hydrogen bonding and large, highly-polarizable electron cloud, n-Butylamine would have the strongest intermolecular forces and thus its molecules would have the hardest time escaping the surface, leading to a low vapor pressure. The two choices for oxidation reductions are 2F− → F2(g) + 2e− (because fluoride ions are present in the solution) and 2H2O(l) → O2(g) + 4H+ + 4e− (as water will lose electrons when oxidized). As we flipped the reactions, we must also flip the signs, so for the fluoride reaction E°ox = −2.87 V and for the water one E°ox = −1.23 V. The half-reaction with the less negative value is more likely to occur, so the answer is 2H2O(l) → O2(g) + 4H+ + 4e−. (b) (i) Calculate the standard cell potential for the cell. (ii) Calculate the Gibbs free energy value for the cell. Oxygen gas is evolved in the oxidation reaction, meaning that is occuring at electrode B. Oxidation always occurs at the anode, so electrode A is the cathode and electrode B is the anode. 6. Aniline, C6H5NH2, is a weak base with Kb = 3.8 × 10−10. (a) Write out the reaction which occurs when aniline reacts with water. The aniline will act as a proton acceptor and take a proton from the water. For the above equilibrium, Kb = [C6H5NH3+][OH−]/[C6H5NH2]. The concentrations of both the conjugate acid and the hydroxide ion will be equal, and the concentration of the aniline itself will be approximately the same, as it is a weak base which has a very low protonation rate. You can do an ICE chart to confirm this, but it is not really necessary if you understand the concepts underlying weak acids and bases. (ii) What is the pH value for the solution in b(i)? 7. A rigid, sealed 12.00 L container is filled with 10.00 g each of three different gases: CO2, NO, and NH3. The temperature of the gases is held constant 35.0 °C. Assume ideal behavior for all gases. The partial pressure of a gas is equal to the total pressure time the mole fraction of that gas. If all gases are at the same temperature, they have the same amount of kinetic energy. KE has aspects of both mass and velocity, so the gas with the lowest mass would have the highest velocity. Thus, the NH3 molecules have the highest velocity. The most common reason for deviation from ideal behavior is that the intermolecular forces of the gas molecules are acting upon each other. This would occur when the molecules are very close together and/or moving very slowly, so deviations would occur at high pressures and/or low temperatures.